Wild Life Drawing and Sky Birds are pleased to present a full day of Drawing & Flying with British Birds of Prey, out in the glorious Kent countryside. We will spend a full day with seven different bird species – including the Kestrel, Peregrine Falcon, Common Buzzard and the Tawny, Barn and Little Owls. We will spend the morning drawing the birds from life and learning all about their habitats, diets and expert hunting techniques plus any conservation issues affecting them here in the UK. During the afternoon, we will experience the birds in flight with a display by experienced and knowledgeable falconers Paul and Ryan! Participants will have the chance to feed and fly the magnificent birds as well as learning the basics of falconry. This experience day is open to all ages and abilities and we welcome children aged twelve and above as long as they are accompanied by an adult. The aim is to inspire a sense of appreciation and understanding for British birds through creativity and close interaction, and the unforgettable experience of watching them soar through the sky! Our day will start at Tonbridge Railway Station where we will be collected by minibus and taken out to the fields and fresh air of Honnington Farm, amid 600 acres of Kent countryside. After teas, coffees and refreshments we will be introduced to each of the owls with a short talk, and we will examine the anatomy and adaptions of the birds before spending some time sketching. Helpful hints and artistic guidance will be on hand throughout from workshop leader Jennie Webber and all paper and a variety of drawing materials will be provided. A seasonal light lunch will be provided at 1pm and you’ll have the opportunity to explore Honnington’s beautiful gardens, organic vegetable plots and bee hives, not to mention the beautiful views. During the afternoon, we’ll take a short walk out to the flying site where the Sky Birds of Prey team will demonstrate the flying abilities of the birds with the basics of falconry. As apex predators, birds of prey are complex creatures – each with their own habits and characteristics – and we will be learning about the unique flying and hunting styles adopted by the different species. Each attendee will have the opportunity to wear the glove and experience flying the birds themselves – it really is an amazing feeling! Your ticket includes minibus transport to and from Honnington Hall from Tonbridge Railway Station, refreshments upon arrival, all drawing materials and paper and a picnic lunch sourced locally. It does NOT include train travel to Tonbridge Railway Station as some participants may choose to use other methods of transport or to use their own railcards. An off-peak Day Return from London Stations to Tonbridge is currently £13.80. 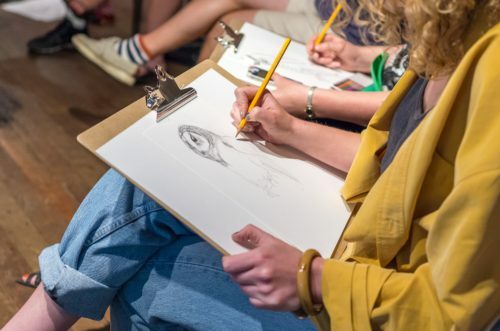 Wild Life Drawing’s founder and tutor Jennie Webber will be meeting anyone travelling from London to catch the 9.15AM train from Charing Cross to arrive into Tonbridge for 10AM to join up with the rest of the group and catch the minibus together to Honnington Hall. At the end of the day a minibus will take us all back to Tonbridge Station for us to continue our journeys homewards.